In 2010 she has been awarded one of the prestigious European Research Council (ERC) Grants for starting independent researchers in the domain of Physical Sciences and Engineering for the project VISION (Video-oriented UWB-based Intelligent Ubiquitous Sensing) (Duration: 4 years). Laurea (master-level) degree in Electronic Engineering, University of Rome "Tor Vergata", Rome, Italy. Major in Electronics, minor in Telecommunications. Research fellowship from FUB (Rome, Italy) on simulation of active optical components based on semiconductor optical amplifiers for all-optical signal processing. Research fellowship from the Electronic Engineering Department of the University of Rome "Tor Vergata," on "Research on new generation mobile communication systems (Universal Mobile Telecommunications System) employing time division multiple access (TDMA)." Ph.D. research fellowship from the University of Rome "Tor Vergata." Summer Manager with a short-term scholarship with AT&T RESEARCH, NEWMAN SPRING LABS, Dr. Schultz , Red Bank, NJ, USA. Part-time researcher with OPTOSPEED ITALIA S.R.L. Registered Engineer qualification (grade : 119/120). PhD Degree in Telecommunications and Microelectronics Engineering, University of Rome "Tor Vergata", Italy. Cassioli, D. (2012). 60 GHz UWB channel measurement and model. Paper presented at the Proceedings – IEEE International Conference on Ultra-Wideband, 145-149. Cassioli, D. (2011). UWB moves up to mmWaves: A channel modeling perspective. Paper presented at the Proceedings – IEEE International Conference on Ultra-Wideband, 521-525. Cassioli, D., & Durantini, A. (2004). A time-domain propagation model of the UWB indoor channel in the FCC-compliant band 3.6 – 6 GHz based on PN-sequence channel measurements. Paper presented at the IEEE Vehicular Technology Conference, 59(1), 213-217. Cassioli, D., & Durantini, A. (2005). Measurements, modeling and simulations of the UWB propagation channel based on direct-sequence channel sounding. Wireless Communications and Mobile Computing, 5(5), 513-523. Cassioli, D., Durantini, A., & Ciccognani, W. (2004). The role of path loss on the selection of the operating bands of UWB systems. Paper presented at the IEEE International Symposium on Personal, Indoor and Mobile Radio Communications, PIMRC, 4, 2787-2791. Cassioli, D., & Mecozzi, A. (2009). Minimum-phase impulse response channels. IEEE Transactions on Communications, 57(12), 3529-3532. Cassioli, D., Persia, S., Bernasconi, V., & Valent, A. (2005). Measurements of the performance degradation of UMTS receivers due to UWB emissions. IEEE Communications Letters, 9(5), 441-443. Cassioli, D., Scotti, S., & Mecozzi, A. (2000). Time-domain computer simulator of the nonlinear response of semiconductor optical amplifiers. IEEE Journal of Quantum Electronics, 36(9), 1072-1080. Cassioli, D., Win, M. Z., & Molisch, A. F. (2002). The ultra-wide bandwidth indoor channel: From statistical model to simulations. IEEE Journal on Selected Areas in Communications, 20(6), 1247-1257. Cassioli, D., Win, M. Z., Vatalaro, F., & Molisch, A. F. (2007). Low complexity rake receivers in ultra-wideband channels. IEEE Transactions on Wireless Communications, 6(4), 1265-1274. Ciccognani, W., Durantini, A., & Cassioli, D. (2005). Time domain propagation measurements of the UWB indoor channel using PN-sequence in the FCC-compliant band 3.6-6 GHz. IEEE Transactions on Antennas and Propagation, 53(4), 1542-1549. Mazzenga, F., Cassioli, D., Detti, A., Habib, I., Loreti, P., & Vatalaro, F. (2004). Performance evaluation in bluetooth dense piconet areas. IEEE Transactions on Wireless Communications, 3(6), 2362-2373. Molisch, A. F., Cassioli, D. et al. A comprehensive standardized model for ultrawideband propagation channels. IEEE Transactions on Antennas and Propagation, 54(11), 3151-3166. Persia, S., & Cassioli, D. (2012). Energy/latency trade-offs in geographic routing for ultrawideband wireless sensor networks. Paper presented at the SENSORNETS 2012 – Proceedings of the 1st International Conference on Sensor Networks, 115-118. Persia, S., & Cassioli, D. (2012). IPv4 wireless multimedia sensor networks. Paper presented at the 2012 3rd International Workshop on Software Engineering for Sensor Network Applications, SESENA 2012 – Proceedings, 58-63. Piersanti, S., Annoni, L. A., & Cassioli, D. (2012). Millimeter waves channel measurements and path loss models. Paper presented at the IEEE International Conference on Communications, 4552-4556. She was selected as an Expert for Evaluations of Grant proposals at the Swiss National Science Foundation (SNSF) – Div. Mathematics, Physical and Engineering Sciences, in 2012. 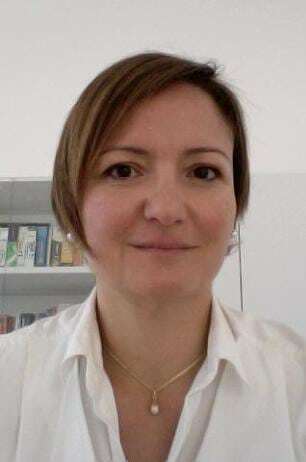 She was selected as an Expert for the Evaluation and Review of IST Fp7 European Projects for the Objective 1.1 "The network of the future" since 2009. - Greek Research Program "Archimedes III"
- Greek Research Program "Thalis"
- Greek National Action "Cooperation 2011"